Brookdale Overland Park 119th got the best value for independent living. It felt like you're in a country club. The staff was very good and they pay attention. I went to lunch with my mother for 3-1/2 years and it was very good. It's not a 5-star restaurant but for an independent living type place, it was very good. They had good desserts and you had enough choices on the menu every day. They didn't repeat things in a week. You could always get a hamburger, a sandwich or fries. They had good activities. You could be as active as you wanted there. They had movies, bingo, painting classes, a beauty shop, a library, and a swimming pool. Brookdale was a very nice facility but very crowded in the common areas. It had a lot of people. The staff was accommodating. They had an area for residents to grow their own vegetables, very nice grounds, and a golf area. The director at Brookdale was fabulous. The staff seemed very attentive The place was clean. There were a lot of patient to caretaker interaction. We were very pleased with the site. The best way to get to know a community is by scheduling a tour. See the facilities, meet the staff and residents, and get a feel first hand what it's like to live at Brookdale Overland Park 119th Independent Living. 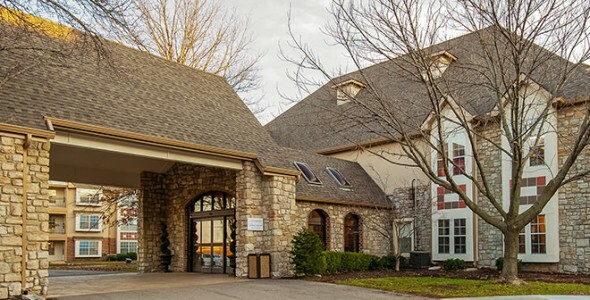 The beautiful, well-manicured grounds of Brookdale Overland Park 119th (formerly known as Brookdale Place Overland Park) provide a lovely setting for our community, where we offer exceptional independent living options for seniors. Conveniently located just minutes from everything Town Center Plaza has to offer, you can enjoy the many dining, shopping and entertainment opportunities - all within easy walking distance. We've thought of all the details that make life carefree and easy. From the elegant cuisine that caters to the most discerning of palates to the convenience of our on-site banking center to caring, professional staff who are available anytime, you'll love knowing we can meet your every need. Brookdale Overland Park 119th is a part of Brookdale, a company that helps residents and family members create senior living solutions that enrich their lives through passion, courage and partnership so they can get the most out of “All the Places Life Can Go.” Brookdale has been providing the very best in senior living solutions since 1978. The Tudor-style architecture and interior lodge décor of Brookdale Overland Park 119th will make you feel like you're permanently on vacation - with all the comforts of home. Our public living spaces offer something for everyone. Celebrate a birthday in our private dining room, get your creative juices flowing in our large arts-and-crafts studio, or join friends in our brand new pub for a friendly game of pool. Our spacious private apartments offer a variety of unique floor plans in one- and two-bedroom styles, complete with plush wall-to-wall carpeting, roomy walk-in closets, fully equipped kitchens with granite countertops and stainless steel appliances, private balcony or patio and emergency call systems. Your small pet is welcome to join you in your new home as well. Our elegant, restaurant-style dining offers a full complement of menu choices, prepared with only the freshest ingredients by our master chef. From our knowledgeable concierge, to weekly linen and towel service, to our door-to-door transportation for area services, dining and shopping, we've included everything for a carefree lifestyle. At Brookdale Overland Park 119th, you'll experience senior living at its finest.